Alexandria, VA—As the City of Alexandria prepares for the unveiling of King Street Park at the Waterfront in the fall of 2018, Visit Alexandria is pleased to announce the founding private sector funders of the King Street Corridor Initiative. The initiative is a coordinated effort leveraging the opening of Old Town Alexandria’s new park in order to maintain the competitiveness of the historic district’s retail corridor amidst the emergence of new highly-funded waterfront destinations in the Washington, D.C. region. Visit Alexandria is leading the fundraising effort to develop a $350,000 public/private marketing partnership to increase support for programming and events in the new park space—the crown jewel of the city’s waterfront plan, which has been decades in the making. With ten private sector partners committed to date, Visit Alexandria has already raised 80% of the match. The three core components of the King Street Corridor Initiative are: programming, beautification and marketing. Visit Alexandria is coordinating a schedule of seasonal programming such as a pop-up beer garden, mobile history exhibits, public art and live music for King Street Park at the Waterfront as well as activation along the King Street corridor in partnership with the City of Alexandria and local shops and restaurants. The City of Alexandria is investing $357,000 in the beautification of King Street, which is necessary in order for one of the Great Streets of America, as designated by the American Planning Association, to maintain its appeal. Beautification plans include hanging flower boxes and increased street cleaning and maintenance. 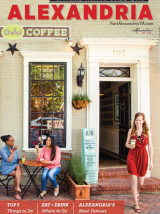 The final focus area, marketing, is critical to fulfilling the goals of the initiative by giving D.C. regional residents new reasons to return to Old Town while raising the profile of Alexandria as a waterfront destination to overnight visitors. For the marketing and programming portions of the initiative’s budget, the City Manager issued a challenge grant to Visit Alexandria to raise $175,000 in private sector funds that would be matched 1:1 by City funds. The launch program will span one year, from July 2018 to June 2019. City of Alexandria partners include the Department of Project Implementation, Department of Recreation, Parks and Cultural Activities, Office of Historic Alexandria, and Transportation and Environmental Services Department along with Visit Alexandria.